Stimulation may be required to allow detection of the phosphorylated protein. Please see images below for recommended treatment conditions and positive controls. Synthetic peptide (the amino acid sequence is considered to be commercially sensitive) within Human MLKL aa 350-450 (phospho S358). The exact sequence is proprietary. 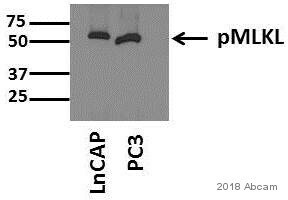 This antibody was developed through collaboration with the lab of Xiaodong Wang at the National Institute of Biological Sciences, Beijing. Our Abpromise guarantee covers the use of ab187091 in the following tested applications. WB 1/1000 - 1/2000. Predicted molecular weight: 54 kDa.Can be blocked with Human MLKL (phospho S358) peptide (ab206929). Lane 3 : HT-29 (human colorectal adenocarcinoma) treated with TNF alpha+ Smac mimetic + z-VAD and phosphatase whole cell lysates 20µg. The lysate in this image is prepared by 1%SDS Hot Lysate buffer. For Lysate preparation protocol, please refer to the protocol book in the protocol section and/or here (downloadable copy). 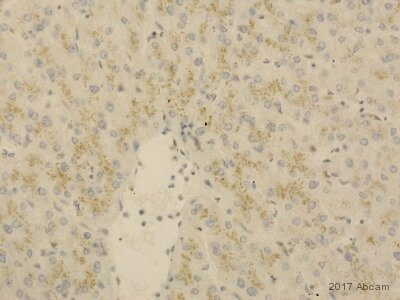 ab187091 at 1:250 staining MLKL (phospho S358) in Human melanoma tissue by immunohistochemistry (FFPE). 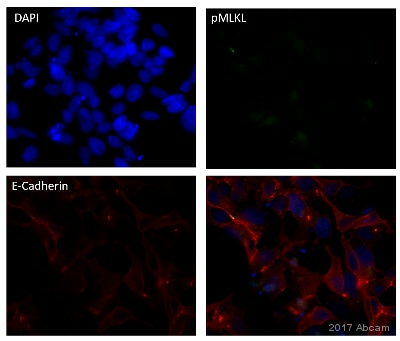 ab187091 at 1:250 staining MLKL (phospho S358) in Human skin tissue by immunohistochemistry (FFPE). 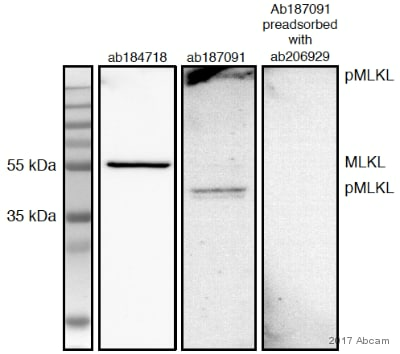 Dot blot analysis of MLKL peptides using ab187091 at 1/1000 dilution followed by Goat Anti-Rabbit IgG, (H+L),Peroxidase conjugated secondary antibody at 1/1000 dilution. Blocking and diluting buffer was 5% NFDM/TBST, exposure time 3 minuts. 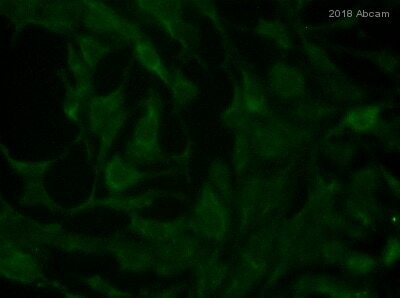 Sample: HT-29 (Human colorectal adenocarcinoma epithelial cell) treated with 20 ng/ml TNF-a, 100 nM Smac mimetic and 20 µM z-VAD for 8 hours whole cell lysates 10 µg per lane. Lane 1 : HT-29 (Human colorectal adenocarcinoma epithelial cell) treated with 20 ng/ml TNF-a, 100 nM Smac mimetic and 20 µM z-VAD for 6 hr. The lysate is directly prepared by 1xSDS loading buffer. Lane 2 : HT-29 (Human colorectal adenocarcinoma epithelial cell) treated with 20 ng/ml TNF-a, 100 nM Smac mimetic and 20 µM z-VAD for 8 hr. The lysate is prepared by 1%SDS Hot Lysate buffer method. For 1%SDS Hot Lysate preparation protocol, please refer to the protocol book in the protocol section and/or here (downloadable copy). Details on WB tested positive control samples: HT-29 cells were treated with the indicated stimuli for 8 hr and then harvested. The final concentrations of 20 ng/ml TNF-a, 100 nM Smac mimetic, and 20 µM z-VAD were used to induce necrosis. Publishing research using ab187091? Please let us know so that we can cite the reference in this datasheet.